It’s no secret: farming has been tough the last several years. 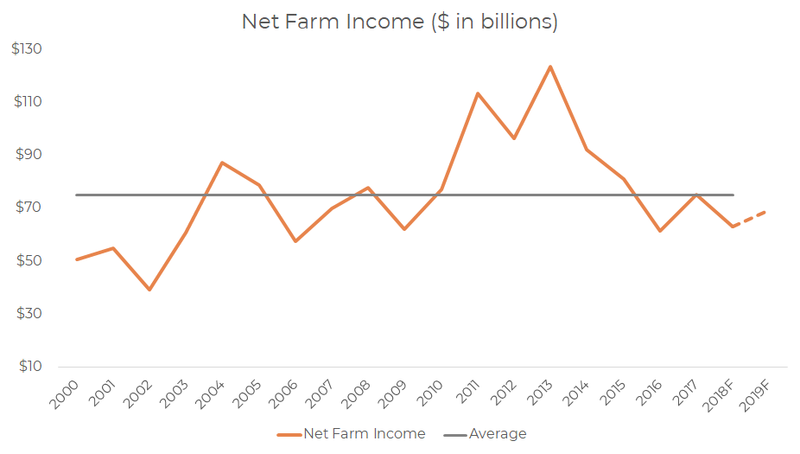 Between depressed commodity prices, challenging production expenses, and more recent trade wars, farm net income has been below trend for the last 4 years. This has resulted in many farmers having unprofitable operations and a heavier reliance upon government payments. Now the good news: after a challenging run, farm net incomes are projected to increase in 2019. 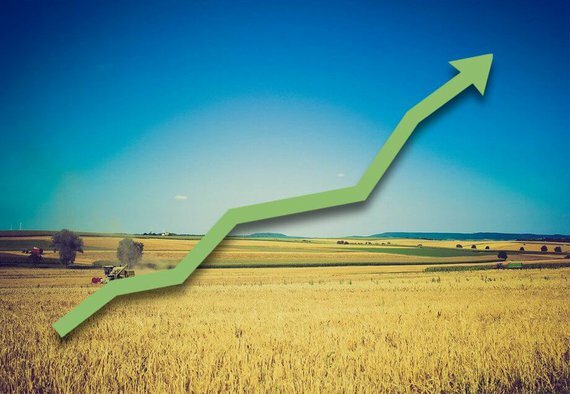 While these are just forecasts that are subject to change, and trends are still below-average, improving farm incomes would be a positive development for both farmers and landowners. Net farm income, as calculated by the USDA, is simply farm revenues (like value of crops sold) minus the costs of running a farm (like labor, seed, fertilizer, rent, equipment, etc). These variable expenses tend to inflate over time, but a large recent determinant of farm income has been lower revenues from depressed commodity prices. As the chart below shows, after a string of good years from 2011 through 2015, more recent income levels have been challenging for U.S. farmers. However, forecasts for 2019 give some reason for optimism, as net farm income is expected to improve by approximately 10%. One of the drivers of expected farm income in 2019 is increasing crop revenues. 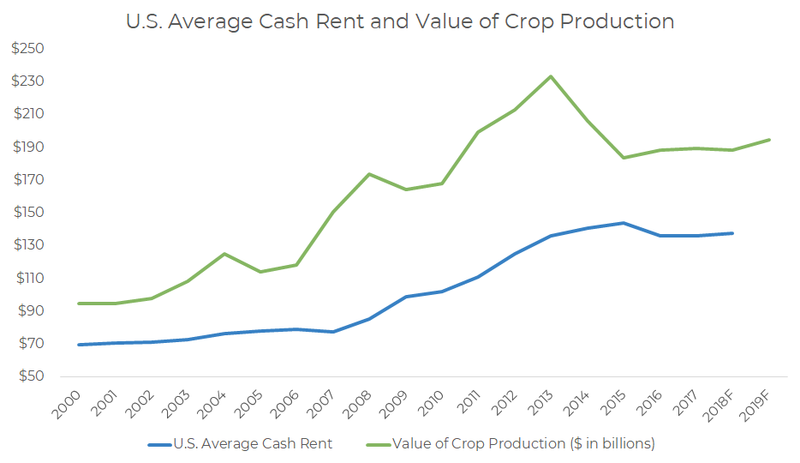 While historical U.S. average cash rents have shown much less volatility than value of crop production, the two are positively correlated. This is generally because when farmers have more revenue, they tend to share it with the landowner. Given this positive relationship between revenues and rents, it would seem that improving revenues would have a positive impact on rents paid to landowners. 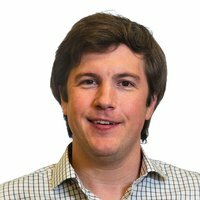 While the stated cash yields on AcreTrader offerings use existing rent rates, improvements in rent on any given farm would provide upside to this cash yield. For a deep-dive on 2019 agricultural predictions, check out the historical data from the USDA Economic Research Service, as well as this thoughtful analysis from leading ag economists David Widmar and Brent Gloy. Additional Note: The information above is not intended as investment advice. Data referenced herein is through year-end 2018 and is sourced from the USDA Economic Research Service with additional calculations and analysis performed by AcreTrader. Past performance is no guarantee of future results. For additional risk disclosures regarding farmland investing and the risks of investing on AcreTrader, please see individual farm offerings as well as our terms and disclosures.